I have a beautiful & wonderful wife with 4 equally beautiful daughters. As husband and father there is not a day that goes by that I do not love them and seek their best interest. I can honestly say that never has it crossed my mind to be permanently separated from them. They belong to me and I belong to them because we are blood-related family. Likewise, Christians belong to Jesus and Jesus to believers because they have been blood bought family. This statement was made to remind us that Christianity is not a solo lifestyle. As a fish was made for water so a Christian was made for God’s church. Today we begin a series called “God’s Body” to gain a greater understanding of our role together as Christians and church members; to be sure both are not exclusive of one another. If someone left an infant on the church door steps we would do everything possible to care for the child and help provide him/her a loving environment and faith-filled home. When a husband and wife have children they do all they can to love and lead that child to health and maturity. Even medical research shows that infants and toddlers are not able to grow properly without physical touch and provision from a family. And as children grow and mature they gain greater accountability and are expected to transfer responsibility for their own development from full dependence to semi-independence. If this does not occur then that means there is some sort of dysfunction or disability among persons in that family. Likewise, the church is the spiritual parents for new believers. They love and disciple them toward Christian maturity, expecting them to grow into maturity in order to serve and share their faith with others. If this does not occur then dysfunction occurs. Further, some believers keep themselves as spiritual orphans because they are inactive or bounce around multiple families. In today’s vernacular this is called church hopping. Something is wrong with either the child or the system if the child cannot stay connected to a family. Christians today must learn to grow with a faith family, flaws and all, or they will orbit in spiritual orphan-hood. It is significant to note that each of the NT books/letters were written not just to pastors or church leaders but to the church – gathered Christian believers. Christians were expected to gather for worship, instruction, fellowship and then scatter for evangelism and mission. Let’s examine Jesus’ view for His church and how that applies to us today. In the context of this chapter of the Gospel of Matthew, Jesus has been training the twelve disciples through teaching and application; truth is meant to transform and be lived out. The disciples have learned from Jesus and have followed in his example of service. In previous chapters (14-15), Jesus miraculously fed the 5K and 4K through the service of the disciples. Jesus has reached a climax in his ministry with great crowds following him. In this passage we can see 3 requirements of God’s church. Peter speaks for the other disciples saying Jesus is “the Christ, the Son of the living God”. Peter’s response is not stating Jesus’ last name – “Christ”. Christ (χριστος) is actually a title meaning “anointed one”. In other words, Peter was declaring Jesus to be the Messiah and promised Deliverer & King of Israel. Further, Jesus is divine – the Son of the living God. Jesus is the living God rather than the dead gods of mythology. The district of Caesarea Philippi was originally called Paneas, after the Greek God Pan. Caesar Augustus took over the region and gave it to his son Philip and thus the name in this passage. Jesus commended Peter’s response for correctly noting the identity of Christ in the midst of imprecise and polytheistic views of God. ð Faith in Jesus is personal; it is not a social media poll or group decision. Christianity requires the individual to turn over their trust from one object to the person of Jesus Christ. God has no grandchildren, you must acknowledge Jesus’ identity as no one can do it for you. God is interested in more than a single decision of salvation – He wants supreme devotion. ð Fundamental to Christianity is Jesus’ primacy. Jesus is not one of many Gods or multiple paths to eternal life. Jesus is not a genie-god catering to human comforts. Jesus is the God of heaven and earth, who is King, Lord and Judge. ð Foundation of God’s church is Jesus. Your view on Jesus will determine your view on life and relationship to the church. High view of Jesus then participation in God’s church and proclamation of God’s truth. Low view of Jesus then minimalist view and participation in God’s church. Essentially becomes pluralistic and politically correct views of God and morality. After Jesus commended Peter for his confession of Jesus as the Christ, He declared God’s ultimate purpose on earth. Jesus tells Peter (πετρος = small & single rock, pebble) that upon a greater rock (πέτρα = substantial & solid rock, mountain) He will build His church. – Is Jesus installing Peter as the leader of His church? – Is Jesus commending Peter’s confession for His church? Acts 2:37-42 “Now when they heard this they were cut to the heart, and said to Peter and the rest of the apostles, “Brothers, what shall we do?” And Peter said to them, “Repent and be baptized every one of you in the name of Jesus Christ for the forgiveness of your sins, and you will receive the gift of the Holy Spirit. For the promise is for you and for your children and for all who are far off, everyone whom the Lord our God calls to himself.” And with many other words he bore witness and continued to exhort them, saying, “Save yourselves from this crooked generation.” So those who received his word were baptized, and there were added that day about three thousand souls. And they devoted themselves to the apostles’ teaching and the fellowship, to the breaking of bread and the prayers. Scripture as a whole supports that Jesus was referring to Peter’s confession rather than his position in the church. The church is built on the apostle’s teaching of Jesus as the Christ and cornerstone; the solid rock. The word for church (εκκλησια) is the first time it appears in the NT. The word refers to a community called out or summoned to a specific purpose. God’s people are called out of darkness and into marvelous light to declare God’s grace and goodness (1Peter 2:9). The Bible uses various metaphors for the church: family/children (2Cor6:18;1Tim 5:1-2); Christ’s bride (Eph 5:32); branches on a vine (Jn 15:5); an olive tree (Rom 11:17-24); a field of crops (1Cor 3:6-9); a building (1Cor 3:9); a harvest (Mt 13; John 4:35); the body of Christ (1Cor 12); God’s house or a new temple or living stones (Heb 3:6; 1Pet 2:5); a priesthood (1Pet 2:5); the pillar and bulwark of the truth (1Tim 3:5). Further, Jesus says the church is His possession; it belongs to Him. Jesus is the Owner, the Architect/Builder, the cornerstone, Shepherd, Savior, Lord and King over the church. ð Our faith should have His fingerprints on our lives; heart, soul, mind and strength. Faith is not passive but progressive. Believers are to cooperate with Jesus’ work through consistent Bible study, prayer, fellowship & accountability as well as encountering God’s grace through gospel reflection. As a local church we are family. We are adopted children of God (Romans 8) and have become brothers and sisters in the Lord (?). We have become members of one another (1Corinthians 12:12, 27). Therefore we must commit & connect together to grow in Christ. ð Our fellowship of believers should emphasize strengthening existing churches and starting of new churches. µ Gates of hell/hades shall not prevail against God’s church. The gates of death cannot hold persons in because Jesus is the Savior and Resurrected Lord who opens the gates. Death shall not prevail. Jesus says Peter will be given the keys of the kingdom of heaven. These are the keys to open salvation as Jesus says in Revelation 1:18 “I am the first and the last, and the living one. I died and behold I am alive forevermore, and I have the keys of Death and Hades.” Upon Peter’s teaching the content of the gospel of Jesus Christ, persons receive salvation. Peter says in Acts 4:11-12 “This Jesus is the stone that was rejected by you, the builders, which has become the cornerstone. And there is salvation in no one else, for there is no other name under heaven given among men by which we must be saved.” Salvation is not granted by Peter or the church but by Jesus; yet Peter and the church (believers today) are mouthpieces for this salvation. The authority believers have to promise salvation OR to reprove sinners does not come from ourselves but from God’s word. We “loose” or “bind” based on the set standards and truths of Scripture. ð Proclamation of this truth must go to every nation, every family, every house and every person. 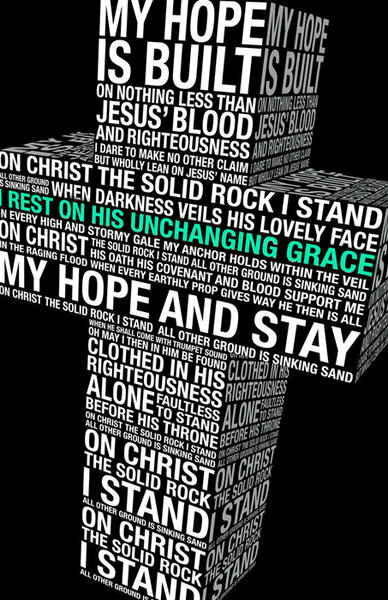 ð Proclaiming our faith must include the full gospel: Jesus grace to forgive along with humanity’s need to surrender (repent) and see Jesus as spiritual redeemer and Lord of life. The charge not to tell anyone Jesus was the Christ was to ensure they had the full concept of Messiah who would not be a physical, military leader but a spiritual, suffering servant to die substitutionary for human sin and resurrect for the hope of eternal life. µ Jesus, God’s body, was broken for broken sinners. µ Jesus, God’s body is broken and by his wounds we are healed.